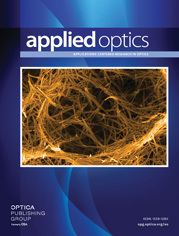 The authors are with the Institute for Ultrafast Spectroscopy and Lasers, Mediphotonics Laboratory, New York State Center of Advanced Technology for Ultrafast Photonic Materials and Applications, Departments of Electrical Engineering and Physics, The City College and The Graduate School of The City University of New York, New York, New York 10031. Translucent scattering phantoms hidden inside a 5.5-cm-thick Intralipid solution were imaged as a function of phantom scattering coefficients by the use of a picosecond time-and space-gated Kerr–Fourier imaging system. A 2-mm-thick translucent phantom with a 0.1% concentration (scattering coefficient) difference from the 55-mm-thick surrounding scattering host can be distinguished at a signal level of ~10−10 of the incidence illumination intensity.